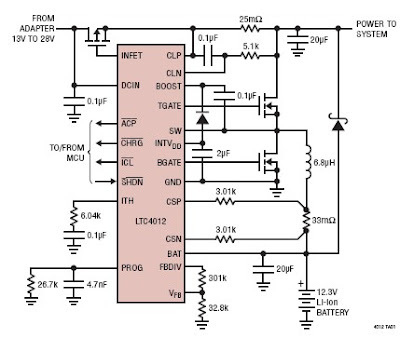 Here is very simple but very fast battery charger electronic circuit diagram project, the Linear Technology Corporation introduces the LTC4012, LTC4012-1 and LTC4012-2, fast-charge 4A capable high efficiency switchmode battery charger controllers for multiple battery chemistries. The LTC4012 supports Li-Ion Polymer, NiMH, NiCd and sealed lead acid battery chemistries in single and multicell configurations. The LTC4012 offers an adjustable battery termination voltage, while the LTC4012-1 and LTC4012-2 utilize a programmable internal resistor divider to charge from 1 to 4 series Lithium cells at multiples of 4.1V and 4.2V, respectively. 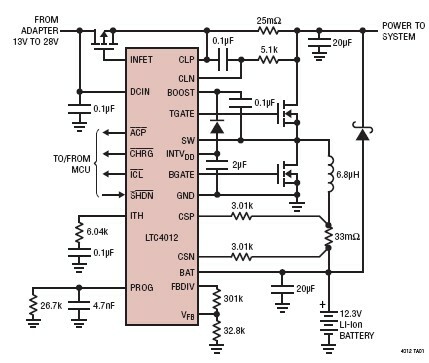 Main features of charger LTC4012 family chips are : Efficient 550kHz Synchronous Buck PWM Topology , ±0.5% Output Float Voltage Accuracy , Programmable Charge Current: 4% Accuracy , Programmable AC Adapter Current Limit , No Audible Noise with Ceramic Capacitors , INFET Low Loss Ideal Diode PowerPath™ Control , Wide Input Voltage Range: 6V to 28V , Wide Output Voltage Range: 2V to 28V , Indicator Outputs for AC Adapter Present, Charging,C/10 Current Detection and Input Current Limiting , Analog Charge Current Monitor , Micropower Shutdown .